was used as a market garden. Ralston Street as it is now known began its days in 1856 and was named after Gavin Ralston, a merchant who lived in the street in the 1850’s. For better or worse most of the early buildings in Ralston Street have been demolished and replaced but there are still a few houses with some historical interest. 1 and 3 Ralston Street were built in 1857, they were owned by the Ralston family and they are lucky to survive as they were very run down. In 1973 the Prahran Council said they were unfit for human habitation and they were ordered to be demolished. Fortunately this didn’t happen and they were lovingly restored in 1987. 14 Ralston Street was a horse cab business between 1890 to around 1910. The cabs themselves sat on Punt Road outside Christ Church and the cab man’s shelter is now in the grounds of Christ Church. The old cab garage was a big tin shed on the south side of the house and this was demolished in 1980 and a townhouse was built in its place. The Gardiners Creek hotel was built on the corner of Ralston Street and Toorak Road in 1856 and had many a name change before closing its doors as The Rose of South Yarra in 1926. 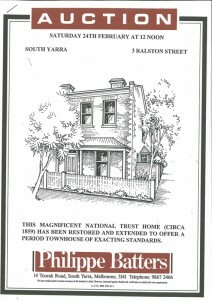 It has previously housed Philippe Batters Pty Ltd estate agents. In more recent times number 37 Ralston Street was developed into an apartment block and some of the apartments have wonderful views of the park opposite. * Peter Davis was elected Lord Mayor in 1856 and built a reputation campaigning against corruption and prostitution on the city streets.